"Michael is a TRULY INSPIRATIONAL SPEAKER"
Meticulous research and preparation are one of Michael’s key point of difference as a speaker. Possessing an innate ability to interpret client briefs, he 'listens' and 'questions', enabling him to effectively weave key business messages into his engagements ~ whether motivational, inspirational or educational, his greatest power is his emotional and intellectual force in connecting with audiences. Passionate, charismatic and thoughtful, Michael delivers powerful learnings that uplift both human and corporate consciousness. He provokes, stimulates and inspires change. Learn how Michael’s single-mindedness, personal drive and obsessive focus on outcomes were critical success factors. From the role his support team played, the extensive research, sponsorship and contingency planning carried out to the sourcing of specialist advisers to help with his mental and physical training, Michael shares the tools that helped him address the multitude of risks that such expeditions attract. At the heart of failure or success, in the face of adversity (difficult circumstances), is something called resilience, an attribute that Michael possesses in bucket loads. How is it that some people can develop their own personal ‘resilience’ strategies and as a result, respond better to for example the pressures that work increasingly throws at us? Through compelling examples, Michael shares how through circumstance, change was forced upon him and how today, he extols the virtues and benefits in establishing ‘Change Champions’ to help support and drive organisational change programmes. Whilst most productive teams share common goals, even a common vision, Michael’s perspectives on teamwork reinforce the view that whilst the ends may sometimes differ, the means by which one gets there are the same. A colourful account of teamwork with the occasional Noel Coward reference around ‘mad dogs and Englishmen go out in the midday sun’ give a unique insight into how the impossible was made possible. Find out what it’s taken for Michael to build a multi-award winning niche family charity with national reach. In today’s world of immediacy driven in part by technology, nurturing that entrepreneurial spirit is something that Michael strongly advocates. "Michael’s speech was absolutely inspirational. Today’s conference was an audience of executive assistants , personal assistants and it couldn’t have been more relevant to people who strive constantly to achieve results. He’s a truly inspirational speaker and has a relevant message for pretty much anybody. I know many people were moved – myself included – during the presentation." "The feedback was overwhelmingly positive. Michael worked very well with me to move from broad topics to specifics relevant to the EMBA's (from Judge Business School, Oxford Said and the London Business School) spanning the public and private sector, from the NHS to JP Morgan. Michael asked specific insightful questions, allowing him to create an excellent flow and bespoke presentation." 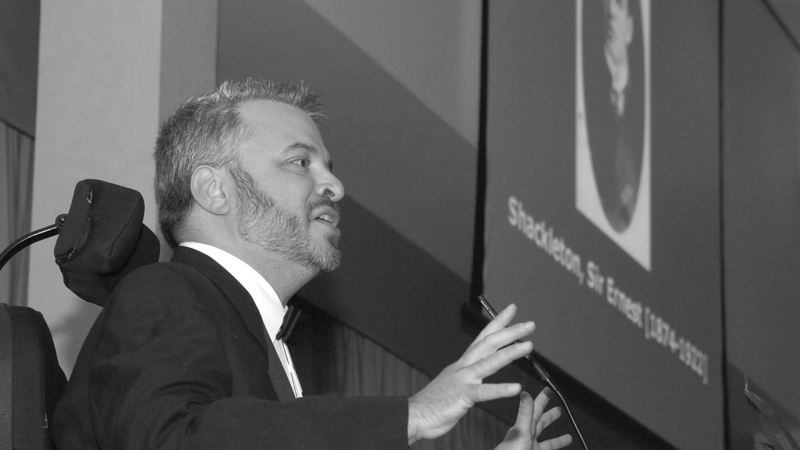 "Michael McGrath was the guest speaker at all four of our All Staff Conferences in summer 2014. The lessons and experiences he shared on leadership, change and overcoming adversity were truly inspirational and thought provoking. Not only did he receive standing ovations at the events, but we continue to receive excellent feedback, 3 months on, as staff have put into practice and learned from the principles he outlined. I would certainly recommend him." By exploring the opportunities presented by diversity and inclusion and specifically disability, pupil’s horizons are broadened and moral, social and cultural beliefs are positively influenced. From Enlightenment Lectures, Awards, Assembly Talks or Prize Giving events, Michael is a powerful asset at delivering insight and inspiration for students.